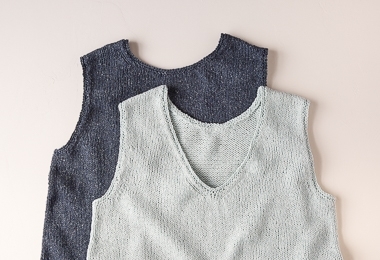 From designer Julie Hoover specially for Purl Soho, the Sayer tank is an easy breezy knit fit for warm weather's most fun activities: outdoor dinners, vacation ramblings, and hammock catnaps. With a V-neck on one side and a crewneck on the other, the Sayer gives you free rein to decide which one to wear in front and which in back... And to change your mind! Sayer’s stockinette body, with slight A-line shaping and garter edges, is worked in two pieces and seamed together at the end. Knit up holding two strands of our fine Cattail Silk, Sayer's fabric is lightweight and cool, natural and totally beautiful. You’ll only need a few skeins to whip up your very own! Please click Product Details, above, for more information about materials, gauge, and sizes. 2 (3, 3, 3, 4, 4) skeins of Purl Soho’s Cattail Silk, 100% silk. The colors shown here are Blue Bamboo and Deep Indigo. To fit actual chest circumference of 30–33 (34–37, 38–40, 41–44, 45–47, 48–51) inches, with approximately 3-6 inches of ease. SAMPLE: The top pictured here is Size 40 inches modeled with 6½ inches of ease.